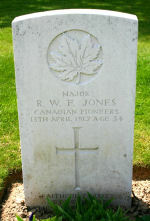 Son of W. J. Jones, of Bowmanville, Ontario. Commemorated on Page 265 of the First World War Book of Remembrance. Request a copy of this page. Villers-au-Bois is a village in the Department of the Pas-de-Calais, 11 kilometres north-west of Arras. The VILLERS STATION CEMETERY is about 2 kilometres north-west of the village.